As we walked along the promenade at Brighton Beach we watched the world descend on Brighton; the hot weather pulled them in like fireflies to a lamp. The bikers were in town today! 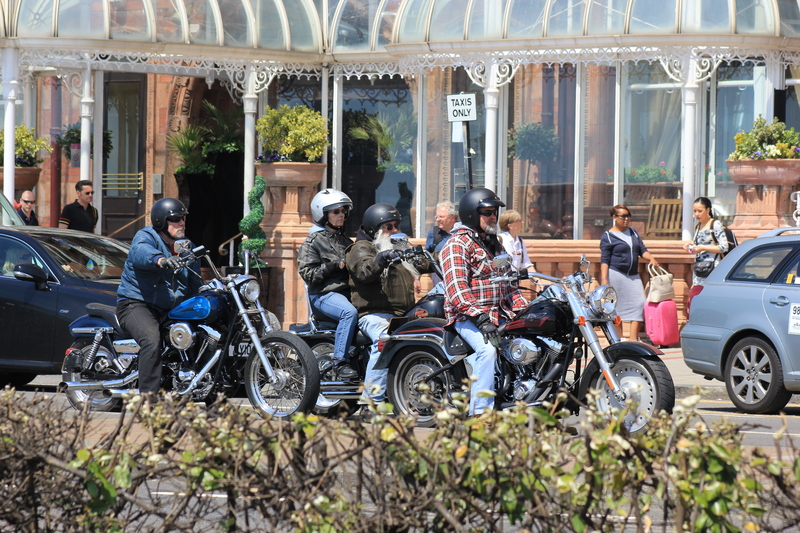 When it comes to Brighton Beach and bikers I tend to think of Quadrophenia. Maybe some of these guys were there – who knows? 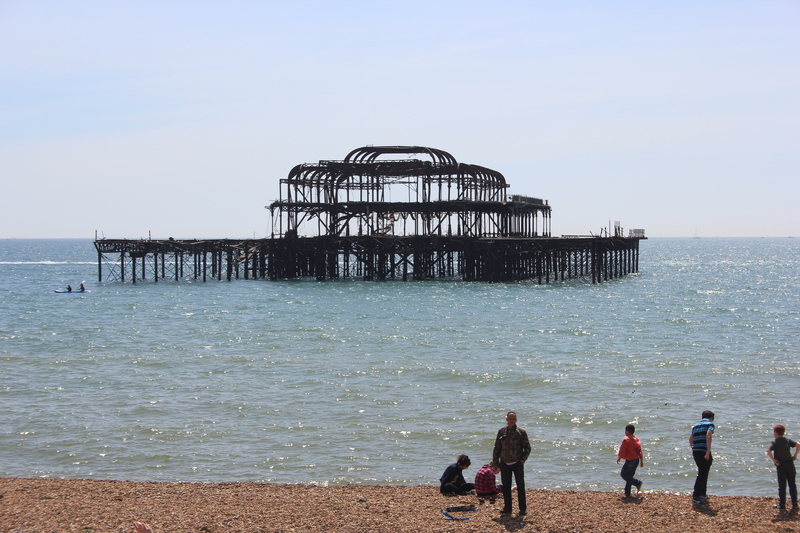 Just over half a mile to the west of Brighton Pier is the West Pier. Having survived numerous storms, and even a mine explosion in 1943, it was the subject of two arson attacks in the first half of 2003 and has remained a burnt-out carcass ever since. Posts stand on the beach, marking the space it used to occupy. The pier head stands out at sea looking like a giant climbing frame, which it is a lot of the time for youths willing to venture out that far. Presumably it is accessible at low tide, though I imagine it is rather a muddy trudge to get there. 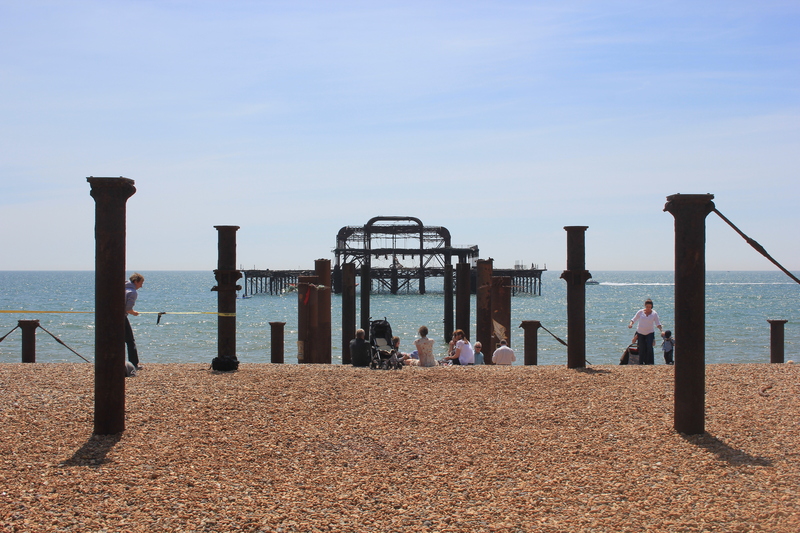 There are major plans afoot for the site of the West Pier. In 2006 planning permission was granted for at i360, an enormous observation tower which will stand at the root-end of the old pier. Scheduled to be built and fully operational by 2015, it will stand at a massive 150 metres high and will dwarf everything else around it. Given that we had just been on the Brighton Wheel and enjoyed impressive views at a height of 50 metres, I imagine that the views from the completed i360, standing three times as high, will be spectacular. As we walked by the posts in the beach some men came along and started measuring the distance between them and taping them off. Were we witnessing the first day of construction? Probably not; they were probably just putting up some form of grand windbreak in preparation for a pleasant afternoon’s sunbathing. 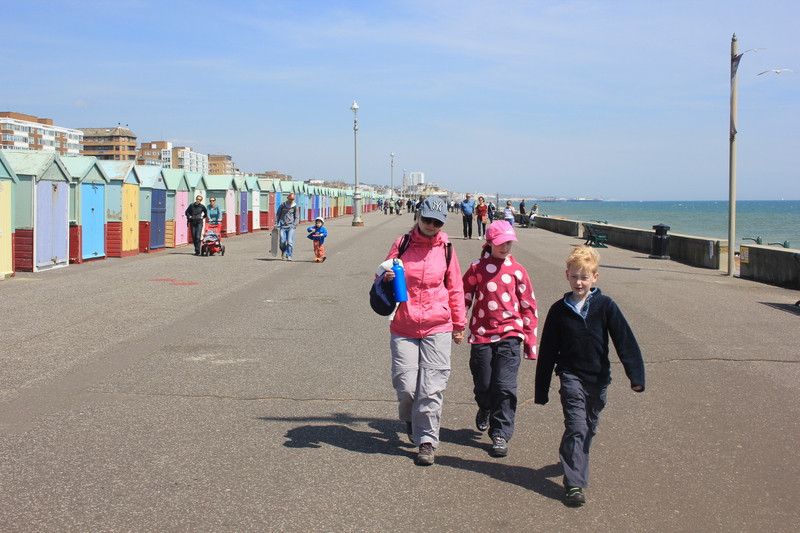 We walked off the beach and back up to the promenade, reaching the Hove Lawns. That was it – we were out of Brighton and into Hove. Alas, Hove caught me at the wrong moment (or maybe I caught Hove at the wrong moment – either way, the moment was wrong). I will best remember my time in Hove for its rather large expanse of tarmac, which even the brightly coloured beach huts struggled to make very interesting. This entry was posted in East Sussex and tagged arson, beach huts, brighton, coast, East Sussex, Hove, pier, travel, walking. Bookmark the permalink.